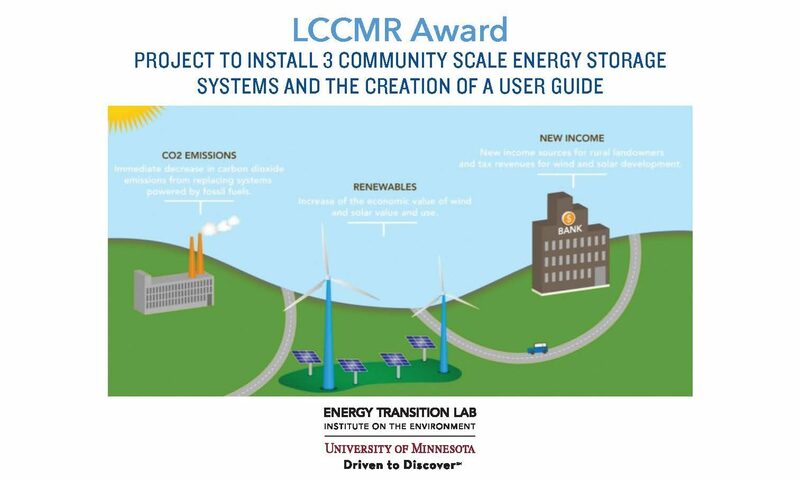 On June 5th, 2018, the Legislative-Citizen Commission on Minnesota Resources (LCCMR) awarded the Energy Transition Lab (ETL) a $550,000 grant for their Community Energy Storage proposal to the Environment and Natural Resource Trust Fund (ENRTF). ENRTF acquires the money through the Minnesota State Lottery and redistributes that money to state causes that benefit the protection, conservation, and preservation of the state’s most vital environmental components. This new Community Energy Storage project will involve conducting research on select Minnesota communities to develop and sustain community-scale energy storage programs. The grant will be divided among two activities. Community-Scale Energy Storage and Renewable Energy Demonstrations: The bulk of the project funding will go to demonstrations. These communities will in turn become representative community-scale energy customers with on-site renewable energy resources and self-controlled microgrids. Community-Scale Energy Storage Guide: Additional research will be conducted investigating the technology, economics, and value streams of the community-scale projects. From this research, a guidebook will be created to help communities choose appropriate and cost effective energy technologies. Ellen Anderson, executive director of ETL, will manage the project. ETL will also be working with Minnesota Energy Storage Alliance (MESA) to provide expert advisors, host the web-based tool, and broadly disseminate results. The intentis to take a two-pronged approach to local energy production and consumption that expands renewable energy while reducing air emissions. Developing energy storage in Minnesota will reduce carbon emissions, reduce energy costs, and generate resiliency benefits as we navigate this essential energy transition. Empowering communities will enable individual energy users, who often lack the resources or knowledge, to more easily participate in local renewable energy resources. The dissemination of the Community-Scale Energy Storage Guide will also ensure that the knowledge learned through this project will be shared broadly and adopted by many others across Minnesota, helping create a real statewide transition. We believe this investigative and integrative approach to energy storage could help Minnesota become a leader in clean energy nationwide.